Godfrey's Mama: Hey!! Wake Up!!!!! About 2 1/2 weeks after my "last post", I found out I had a stage I ovarian cancer. No wonder I didn't have any energy to blog anymore, eh? I had not been feeling well for a few months. I felt bloated, constipated and had a dull pain in my abdomen. I thought it was irritable bowel syndrome. Then, I started needing to get up ever hour and half at night feeling the need to urinate. I also felt thirsty all the time. My Mom has diabetes, so I thought maybe this was my issue as well. I went to the doctor and told her my concern about diabetes. She had me go to have a blood draw and a urinalysis. After several phone calls, my doctor's nurse finally told me the labs indicated I had "borderline diabetes". Luckily, I work in a hospital, so I had the advantage of working with a dietitian. My friend, Sandy, gave me all the information anyone could ever want about diabetes. I began eating better and started monitoring my glucose levels. My blood sugar never went over 106...even after drinking a regular coke. But, I still wasn't feeling quite right. It started to dawn on me that diabetes might not be my problem. Since my internal medicine MD never returned any calls, I decided to make another appt. to see her. I would not end up keeping that appt. A few days later, I was at work and started having some shooting pains in my abdomen. I had been having dull pain for a few months and had learned to deal with it by taking Advil. I was about to start an eval in the acute area of the hospital, but the pain got so bad, I went back to rehab to sit for a bit. I guess I knew this was not good and I wanted to be with my nurses. My friend Flora was working that day. I asked Sandy, the dietitian, to go get her for me. The next thing you know, I was being hustled down to the ER with Garry, Flora and the Unit Nursing manager, Jorilyn. It didn't take too long for me to be taken back and examined. Though, at the time it felt like an eternity. During the multiple questions about my history, Flora and Jorilyn stayed with me and consulted with the ER nurses until they were certain my pain was under control. They really did advocate for me when I could not. Later that evening I had an ultrasound. When the tech asked me if I had a lost a lot of weight recently, I knew it wasn't good. Not that I had lost any weight, but the idea he thought maybe I had, made me really start thinking this could be bad. Then I had the CT scan that pretty much confirmed I had cancer. I had surgery the next day. 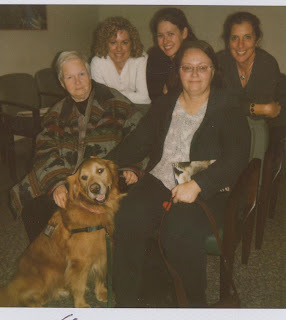 This is a photo of my Mom, Susan, Briana, Cheryl, Lisa with Kai, the therapy dog. They were all waiting for me during my surgery. When I was coming out of the anesthesia, the first thing I heard was my friend, Susan telling me to "wake up". When I say "telling" me to wake up. It was more like "yelling" at me to wake up. I guess I was not interested in waking up from my anesthesia stupor. I don't remember too much about the following 3 days. But, I do remember how wonderful everyone was to me. I had a lot of well wishers, flowers, cards and visitors. My rehab family also gave me a beautiful quilt which they all signed. I will treasure it always. I came home about a week later. My sister, Cheryl, stayed at the hospital everyday and came home with me for a few weeks following my discharge. She would make me eat, take short walks etc. We sat on the couch, compared scars, marveled about how loud the kids upstairs could be and watched a lot of daytime TV. I could not have gotten by without her. It was hard for me (and Godfrey) when she went home. My other sister, Roxana, came down from Seattle for long weekend. It had been a long time since we had been together. It was good to see her and I am thankful for her visit. I have also discovered a thing or two about friendship. I have been blessed with many loving, wonderful people in my life. People who have given their emotional support as well as their time to help me get better. I can never repay them, my rehab/hospital family for their kindness. And to my dear friends Briana, Susan and Lisa. Where would I be without you? Thankfully, it was a stage I ovarian cancer. I have started chemotherapy as a precaution. I have finished two of the six chemo treatments. A quarter of the way done! I am still tired but overall, I am feeling well. Well... with the vicodin and the ambien helping a lot. Cheryl wants me to take less of these meds. She thinks I will get too addicted to them. I'm more worried about my new addiction to "All My Children". Thank you so much for pushing the ER nurses for duladid when the morphine wasn't working. Having you there really gave me a lot of reassurance. Thanks for being there for me. I've been checking weekly for your blog ever since you posted "the last" one, just hoping to read about your daily antics! Your blog helped me feel close, in some ways, to friends in California. I feel like I'm missing everything until I read your blog! Thanks for coming back! I still think you should publish! So, so glad that you are back online with your blog. I'm proud of you. What an idiot I am. Of course it's a third of the way over. I never was good with this "fuzzy" math. Cut me some slack though. I AM being POISONED every three weeks (not to mention, once again, the ambien and vicodin)! It does wreak havoc on elderly brain cells. PS I will drop off my ABC Soap Opera Digest to help feed your new addiction. So glad you starting blogging again! It just feels like I'm a little closer.